Everything You Need to Know about Dry-Type Transformers, and What Makes Them Better? When you have different electrical components operating at the same frequency but at different current or voltage requirements, you need a transformer to convert the voltages or currents. As is the case with most electrical components, transformers also tend to heat up and need a cooling system. You can classify transformers based on the type of coolant used into – dry-type, liquid-cooled, and liquid vapor condensation. Dry-type transformers use air as the dielectric medium and coolant. Since this transformer uses natural cooling, it can be used in different situations where you would have to think twice before using any other type of transformer. Transformers are not always used under the same conditions. There are different types of dry transformers based on their construction. Open wound transformers: These transformers are produced using a dip and bake method. Vacuum pressure impregnated transformer (VPI): These transformers are named so because of the moisture resistant polyester sealant that is applied using the vacuum pressure impregnation technique. The transformer is also made using materials that have high-temperature insulation whose rank is higher than ‘O’ and ‘K’ classifications. This transformer is best suited for the industrial and commercial purpose. They also provide more mechanical power and protection from radiance. Vacuum pressure encapsulation transformer (VPE): This transformer is similar to the VPI transformer with the difference being that it uses a silicon-based resin as sealant. This has thicker insulation and makes VPE transformer perfect for harsh weather conditions. Cast coil transformer: The coils in this transformer are cast in resin using molds, and the process is done under vacuum. These are best for extreme weather conditions with very little maintenance. Cast coil transformers are best suited for offshore platforms and cranes, ships, nuclear plants, mining industry, buildings, and tunnels. 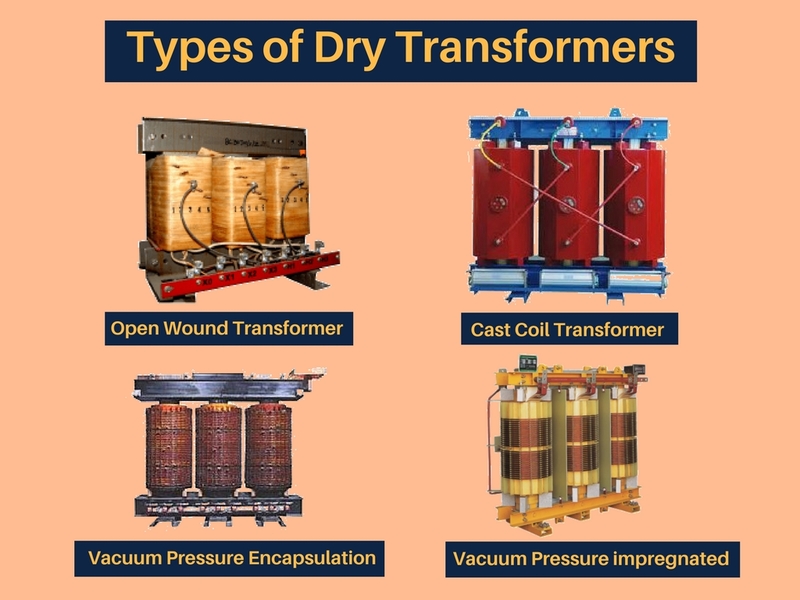 Once the type of dry transformer that you want to purchase is finalized, you should decide on the features of the transformers. Capacity or Power Rating: Any device that is connected to the transformer will have a maximum operating current and voltage, and these values are used to determine the power rating of the transformer. Primary and Secondary voltages: Primary and secondary voltages are the input and output voltages of the transformer respectively. Frequency: This is the frequency of the Alternative Current(AC) available to you. In Canada, this is 60Hz. What Makes Dry-Type Transformers Better Than Others? Environmental Concerns: The liquid coolants used in liquid transformers is a health risk and is even banned in some countries. Since the coolant in the dry transformer is air, there are no such risks, and it is the environmental-friendly option. Fire Risk: There are no flammable materials present in the dry transformer, and that makes it much less of a fire hazard. Size: The core and the coils in the dry transformer are larger when compared to those of the liquid-transformer, but since the dry transformer does not need transition coils or cooling radiators, the overall size of a dry transformer is smaller. Insulation: The dry transformer typically uses a 220 C insulation where aramid paper provides the major insulation. Installation Costs: The dry transformers typically weigh less than the other transformers. They can also be placed closer to the load, ensuring that the length of the cable to connect it to the load is reduced. The disconnecting chambers, catch basins or curbs, pressure release valves, extra space around the transformer, and the higher insurance premium associated with the liquid transformer are all eliminated in the case of a dry transformer. It really reduces its installation cost. Maintenance: The resin coating on the dry transformer’s coils protect it from moisture and dust. So, they can be used in harsher weather conditions and require less maintenance. They need to be cleaned once a year and do not need regular checks for coolant leakages or rust. Even though the price of the dry-type transformer is higher, the lower installation and maintenance costs and a longer lifetime make up for the price. The advantages of using a dry-type transformer outweigh any disadvantages they have and make it the best type of transformer. Now that the type of transformer is decided, this post can help you in choosing a good transformer manufacturer. ElectPower is one of the top dry-type transformer manufacturers in Canada and has a wide variety of transformers that can fulfill all your needs.